Ops, I did it again – it seems I emptied my C:\Autodesk folder without copying it before to my external hard drive. Why? As I ordered my DELL Precision 5520 (best choice ever! ♥) I had to choose between a second SSD or a better battery, so I went for only 1 TB SSD and I try to keep my disk clean (while enjoying a laptop that runs almost the whole day without charging!). The C:\Autodesk folder contains installation files and tends to get really big, especially if you have several products from the Autodesk AEC Collection running on your machine – and most of the time, you don’t need these installation packages again! 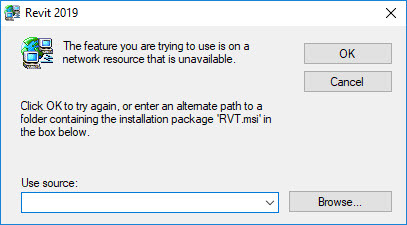 Well, unless for a major update like the Revit 2019.2, which leads to the famous error message “The feature you are trying to use is on a network resource that is unavailable”. It’s not a big deal if you have fast internet, you can just download the Revit installation package again – I always recommend using the “Download now” option in your Autodesk Account. I wrote quite a while ago about the different locations Revit and other Autodesk software are using on your hard drive.